"Consistently great and easy pasta dough. This makes really great homemade linguine or ravioli for a manual pasta machine. If its too sticky, just roll a bit in flour. This recipe makes enough pasta for 24 small raviolis or 4 servings of linguine. Whatever pasta you make should take no more than 4 to 6 minutes to boil." Beat flour, eggs, olive oil, and salt together in a bowl. Add water, 1 teaspoon at a time, to flour mixture until a smooth and very thick dough forms. Turn dough out onto a work surface and knead for 10 minutes. Let dough rest for 5 to 10 minutes. Divide dough into 8 balls and use a pasta machine to roll and cut dough into desired pasta shape. 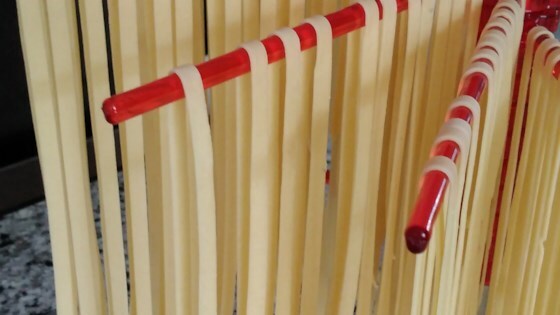 Make homemade fettuccine with or without a pasta machine. Easy dough to make. This is my sixth time making it and I got a little adventurous and added garlic infused oil, and it has upped the flavor. Great for first time pasta makers! First time trying to make pasta. My picky hubby loved it!!! It was pretty easy and now I'm wondering why I've ever bought pasta. Turned out great only change I made was the flour, I used semolina flour. I omit the water and add an additional egg to add creaminess to the pasta. it always has great bite, and every now and then I add tumeric for a rich yellow color. my picky wife eats it right up.